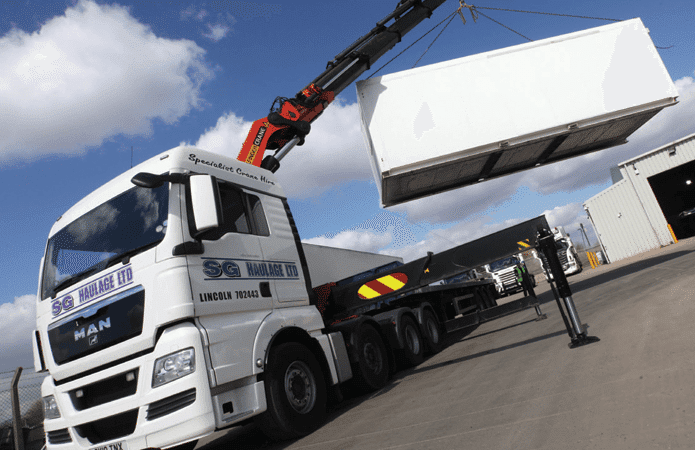 SG Haulage has come a long way since we started with one vehicle in 1993. We now have a fleet of 23 which features a wide range of vehicles to suit all our customers looking for heavy haulage in Lincoln, Nottingham, and Grantham. Our UK fleet includes the following vehicles suitable for heavy haulage: Scania R730 (takes a maximum payload of 56 tons), and the Scania R620 (maximum payload of 40 tons). We also have a range of semi-loaders including a 3 Axle Nooteboom fixed bed with outriggers and double flip hydraulic loading ramps (900mm lower deck height), a 4 Axle Nooteboom Extender with a maximum lower bed length of 14.1 meters making an overall trailer length of 18.1 meters with outriggers and double flip loading ramps and 2 self-tracking steering axles (900mm Lower deck height), a 3 Axle Montrocon Plant step frame fixed bed with outriggers and double flip loading ramps, and various other vehicles including extenders and also lowloaders. Please call us today to see which vehicle suits your needs. 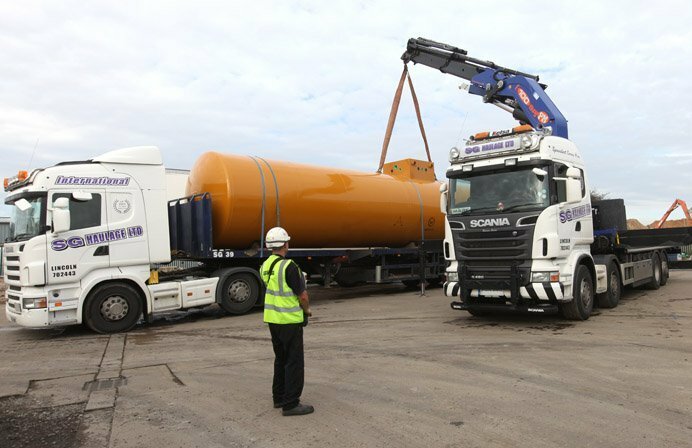 As well as our extensive fleet of heavy transport vehicles, SG haulage also offers crane and forklift truck hire within the United Kingdom. Our crane drivers and operators are all registered with the CPCS, CSCS and ALLMI, and our slinger banksmen are CPCS and NPORS qualified. 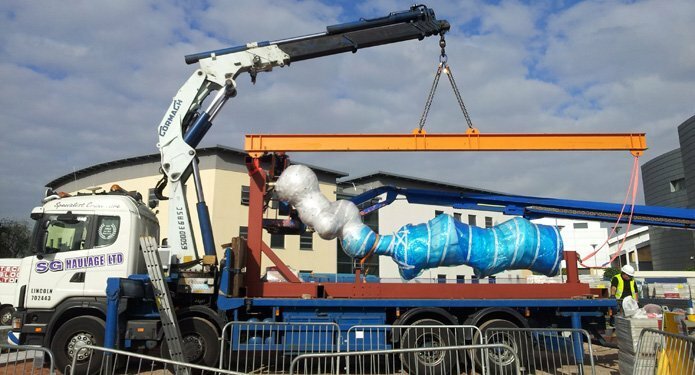 As the first choice heavy haulage company in the Lincoln, Nottingham, and Grantham area, we are ideal to provide you with the very best in crane or HIAB hire for your project. The latest addition to our fleet is a number of self-loading Moffett forklifts, which can lift 2.8 tonnes and have a maximum mast reach of 4 metres. These forklifts are ideal for areas with tight access, and, as they are adaptable to flat trailers and curtainsiders, they are perfect for outdoor events such as festivals. 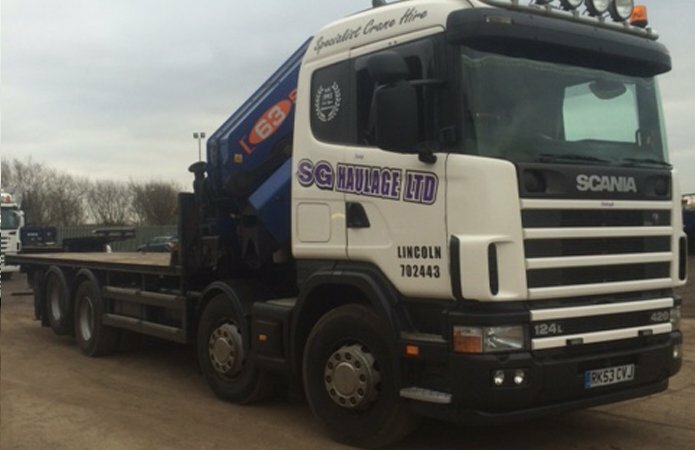 When you choose SG Haulage, you can rest assured that you’re in capable hands as all drivers are CPCS, CSCS and ALLMI registered. Our Slinger Banksmen are also CPCS and NPORS qualified. 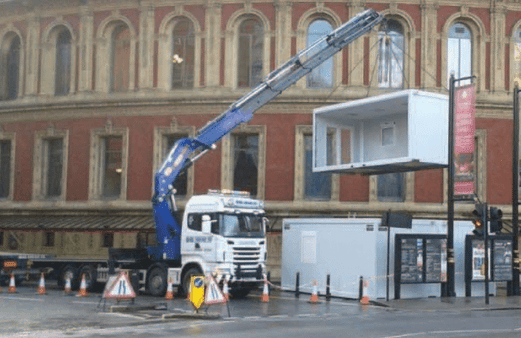 We’re happy to help you find the perfect crane or HIAB hire for your project. Take a look at some of our fleet below. With all crane hire contracts, we will provide the necessary risk assessments, Method Statements and Lift Plans. All equipment is tested every 6 months. More information is available in our up-to-date brochure. For all your heavy transport needs, for any sort of vehicle or boat transport, and for crane and forklift hire, please contact us 01522 702 443 for a free no-obligation quote.